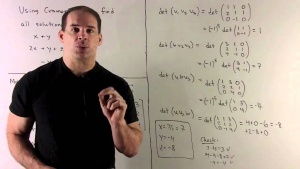 This course contains 47 short video lectures by Dr. Bob on basic and advanced concepts from Linear Algebra. He walks you through basic ideas such as how to solve systems of linear equations using row echelon form, row reduction, Gaussian-Jordan elimination, and solving systems of 2 or more equations using determinants, Cramer's rule, and more. He also looks over concepts of vector spaces such as span, linear maps, linear combinations, linear transformations, basis of a vector, null space, changes of basis, as well as finding eigenvalues and eigenvectors. Finally, he finishes the course covering some advanced concepts involving eigenvectors, including the diagonalization of the matrix, the power formula for a matrix, solving Fibonacci numbers using linear algebra, inner product on R^n, orthogonal transformations, Gram-Schmidt orthogonalization, QR-decomposition, the spectral theorem, and much more. Dr. Bob teaches Cramer's rule for solving systems of three linear equations. 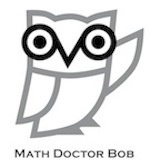 CosmoLearning is promoting these materials solely for nonprofit educational purposes, and to recognize contributions made by Math Doctor Bob (Robert Donley) to online education. We do not host or upload any copyrighted materials, including videos hosted on video websites like YouTube*, unless with explicit permission from the author(s). All intellectual property rights are reserved to Robert Donley and involved parties. CosmoLearning is not endorsed by Robert Donley, and we are not affiliated with them, unless otherwise specified. Any questions, claims or concerns regarding this content should be directed to their creator(s).